Whenever you visit any published article on our website , you will notice mainly three Google’s Adsense ads on our page. Why three? Because currently only three AdSense ad units are allowed by Google ( Read more about Google’s Policies on ad placements here.) We have one Adsense banner placed in the header area, second ad code is placed on the right sidebar and the third ad code is embedded after the first paragraph of the post content. Unlike various other revenue sharing digital platform which only shares the ad revenue for the ad codes that are placed within the post content, we offer it for the all the places including header, post content, sidebar or even footer areas. In this way, we offer authors to get the share from all Adsense codes to its full potential. Unlike other revenue sharing digital platform which only shares the ad revenue for the ad codes that are placed within the post content, we include all the places including header, post content, sidebar, and even footer areas of that post. In this way, we offer authors to get the share from all the Adsense codes placed anywhere on that post page. It’s similar to what YouTube offers to its partners ie. 55% revenue share and that’s why we like to be called “YouTube For The Content Creators”. It means that the approved author will get 55% of the Adsense Revenue generated by their posts. To promote high-quality content writing, we also offer 15% boost in the revenue percentage if the authors come under top 20% of the best-performed authors in terms of their ad earnings. 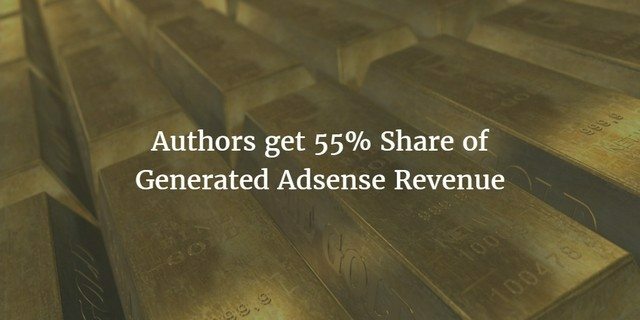 In simple words, top 20% of the best performing authors will get 70% share in spite of the regular 55% of the Adsense revenue generated by their posts. Kindly note that the payment will be made through Paypal or net-banking transfer only when you have generated at least $30 in your Adsense account. Any kind of physical disability can not limit our inner creativities or mental skills to reach the top. 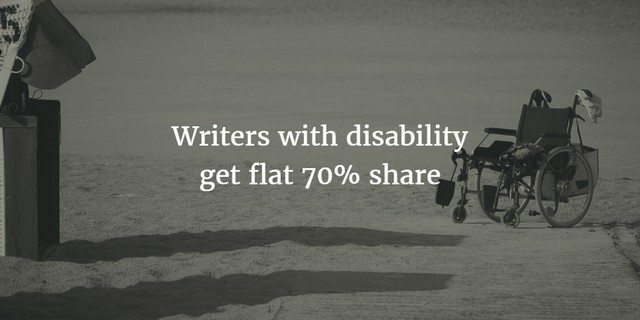 So we are promoting “specially abled” content writers to showcase their writing skill by offering them flat 70% share of the revenue generated by Adsense ads on their published articles. No matter whether they are part of the top 20% of the best performing authors or not, they will always get 70% share. The registration process will be same. authors just need to proof their disability claim by sending us related documents or proof in a separate mail at [email protected] . How to get approved for this program? To get approved for this program, first of all, the user has to register as an author. After a formal verification, he/she will be able to write articles on this website. Upon 10 successful submissions of articles, the author will be entitled as an approved author for “Authors Revenue Sharing Program“. In simple words, an author must have 10 published articles on this website to be considered as an “approved author” of the tomatoheart.com. To know in details about how to keep “Tomatoheart Authors Account’s Status” healthy, click here and to join our “Authors Program” Click the button below.